One of the things you need to consider when you go hunting is how you dress. Obviously, you need to buy some hunting clothes but you still need to keep in mind some tips about combining them. Any outdoor activity means you will get some physical effort and eventually, some sweat will appear. Layering your hunting camo brings comfort on the hunt but doing it right means one problem less when your eyes are on the target. Any layer of your hunting camo clothing has a specific mean and all of the layers need to work together as a system in order to catch heat, keep away moisture and protect against the elements. 0.1 How many layers anyway? The first layer of your camouflage clothing is the base-layer which includes long and short sleeve shirts, tights and other clothes that go directly on your skin. The base-layer acts like a wick moisture while keeping you warm and dry at the same time. The best camo clothing for the first layer is lightweight, wicks the sweat and still gives some insulation so that you remain warm. You’d want this type of clothes especially in milder conditions, when you’re on the move. For the colder conditions you need to go with a mid-weight base-layer that still absorbs moist and doesn’t get you overheated either. As the weather gets more difficult and colder, you have to wear the heavyweight base-layer that also is highly breathable, while powerful on isolation. Most of the base-layers clothes are made of synthetic, as it’s lightweight and fast drying. Some are made of merino wool which absorbs moisture and keeps the bad smells away. The next layer of your hunting clothing needs to be the mid-layer that keeps heat inside and let’s go of moisture. The mid-layers are supposed to be the most flexible ones and they can be removed when you’re overheated. Most popular fabrics for the mid-layer are merino and polyester, but nylon is a good option also. When the weather is milder, the mid-layer becomes your outer layer. Go for a waterproof one, in this case. The protective shell is the outer layer, the first one to protect you against the elements. 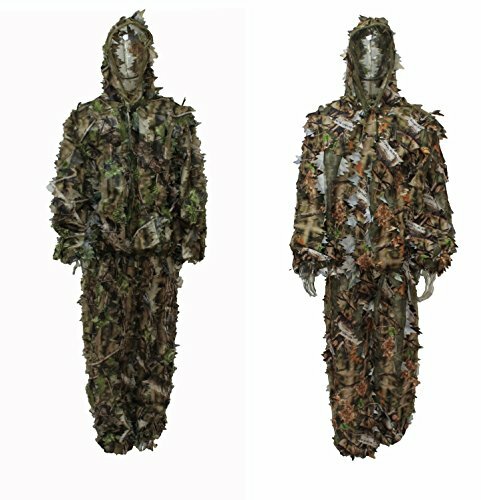 Best hunting camouflage clothing acting as outer layer is resistant to wind, rain and any other nature element. The outer layer has to take good the tree branches, thorny brushes and be easy to pack as you need to remove it when you’re too warm. Simply wearing hunting clothing is not enough as you still need a scent-free clothing. First thing to do is get rid of the personal body scent as much as you can and this means showering with hot water and no commercial shampoos or soaps at least 6 weeks before hunting season. It’s also helpful to stay calm emotionally while hunting to limit as much as you can your scent. Avoid sweating by wearing less layers and move as quietly and slowly as you can. It’s also very important to maintain your hunting apparel scent free. First step is to soak your clothes in cold water overnight. You can add a ½ cup of white vinegar to get rid of the smells. You also need to plunge afterwards the clothes for soaking in some water and then in cold water with ½ cup of baking soda. You may wash every single clothing item for some minutes, always by hand. Rinse the clothing until the water gets clear and wring out as much water as possible by hand again. Use a large chamois towel for each garment, twist tightly and let it absorb it overnight. It’s better to dry outdoors your clothing and once it’s all dry store it in a sealed plastic bag. You may also put some twigs or dry leaves in that bag so that the clothes smell like yours hunt environment. Take a good thought on which kind of hunting you’ll be doing when choosing your hunting clothing. If you go still-hunting, the heavy-duty gear is the key, whereas if you are active, the breathability of the clothes is far more important. Choose the camo of your clothing related to the environment of your hunt as the pattern should fit perfectly. Stay away from cotton as much as you can. Cotton draws heat away from your body and keeps the moisture inside also. Under any hunting circumstances cotton is an option for your hunting clothing. 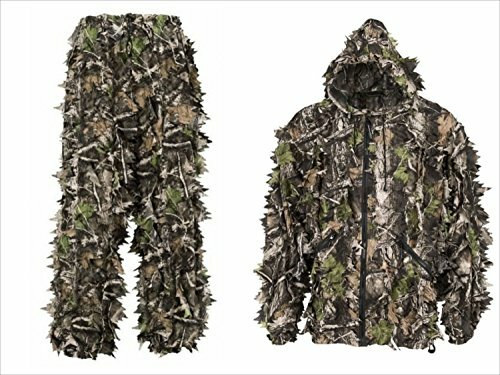 When you want to buy yourself a pretty good hunting suit but don’t know where to begin, a good and low priced option is the Frogg Toggs – All Sport Camo Rain Suit. So, price and quality this is a good, reliable buy anytime. 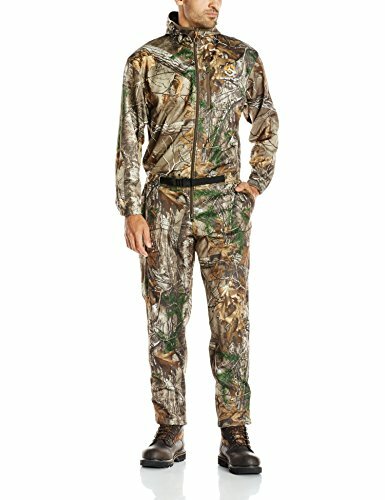 The best thing about this next hunting suit is its ability to make you absolutely invisible into the woods. 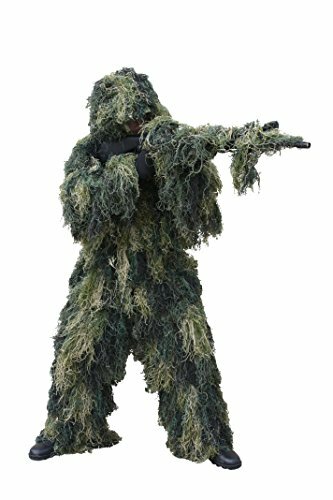 The Reversible Camouflage Hunting Leafy Ghillie Suit is an all year suit that has many other good qualities. But, for this kind of money this suit is a great hunting suit. 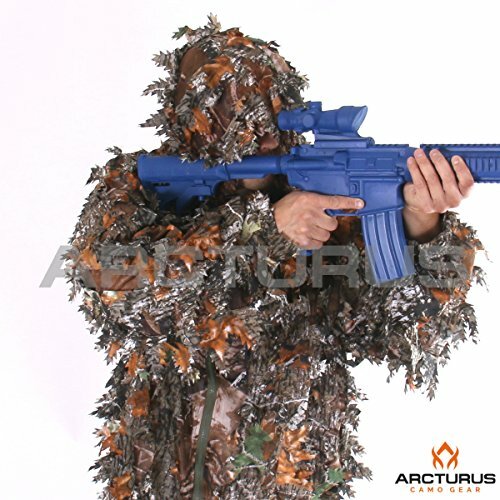 For an amazing blending into surroundings thanks to its 3D design, this Arcturus 3D Leafy Ghillie Suit is an option to consider. Considering the price and the quality you get, this 3D hunting suit is great for your hunting experience no matter the season. 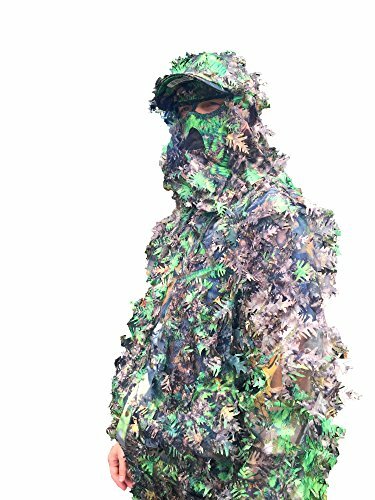 When you really want to hide into the surroundings, a great option is this KLOAK Quikcamo B3D Leafy Suit Mesh. When it comes to the cons, the only thing we like less is it doesn’t come in different patterns as there is only one type of it. If the two-piece suit doesn’t do you any good, then maybe a 3-piece suit is the best choice for you. 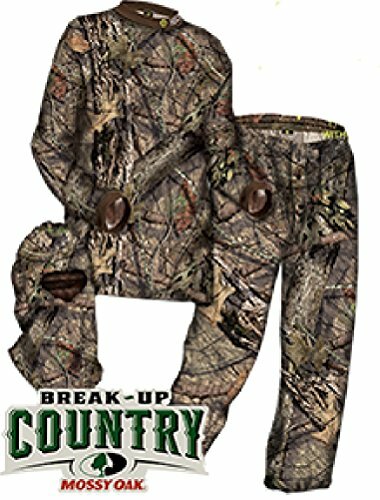 The Hecs Suit Mossy Oak Country 3X is a complete suit with pants, long sleeve shirt and head cover. As for the cons, we don’t have any. If we need to be very critical, then we’d mention the price which is on the high end. As you are on a bow hunting you want to get the perfect hunting experience and not have your bow tangled in your suit. 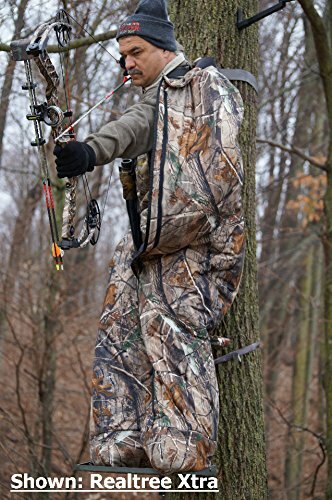 The best bow hunting clothes not only keep your bow safe but they also give you a good hide into surroundings. Therefore, you need a suit like this Scent-Lok Men’s Savanna Quickstrike Coverall. When it comes to cons, we need to mention the fact that this comes in only one camo pattern. Hunting in the wintertime is tricky and challenging. On one hand you need clothing that keeps you warm, but at the same time you need something that gives you freedom on the move. 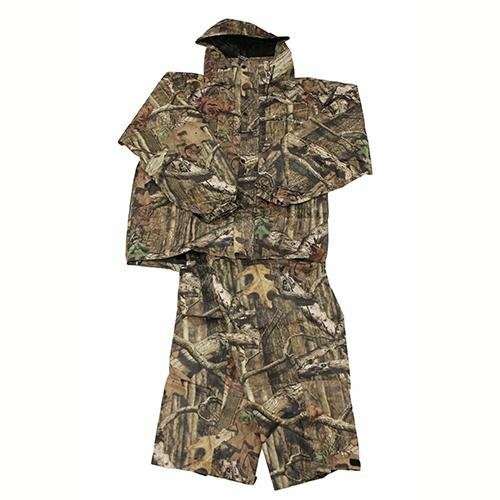 This Heater Body Suit LARGE-WIDE Mossy Oak Break-Up Infinity Hunting Clothes manages to meet both of this important requirements and so much more. Even though it’s made of cotton, the SwedTeam Super Natural Camouflage Leafy Hunting Suit might be your next hunting suit when deer hunting. Apart from these minor issues, this is a great suit to get when you go deer hunting. A low priced, yet efficient hunting clothing when duck hunting is this Red Rock Outdoor Ghillie Suit. Either than that, we can only assure you that ducks won’t notice it at all.